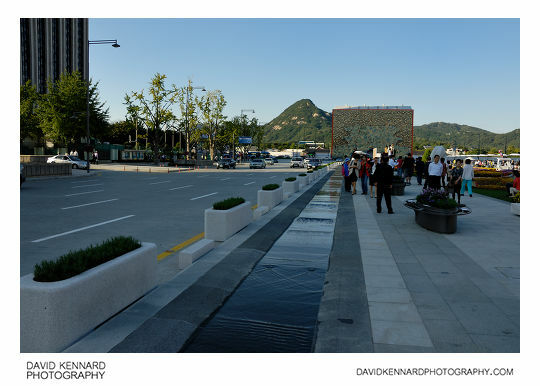 We walked south down Hyoja-ro until we got to the south of Gyeongbokgung, then walked east along the road until we got to the north end of Sejongno, known as the Gwanghwamun intersection. 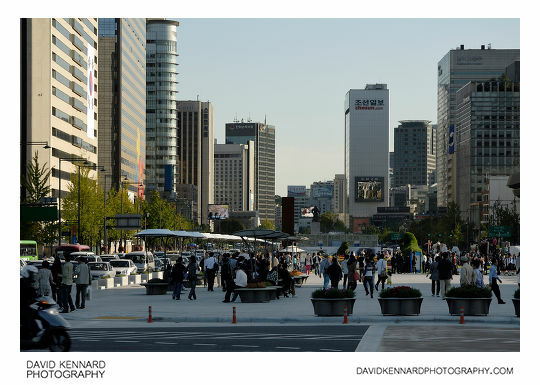 Gwanghwamun Plaza was added to the centre of Sejongno in 2008, with construction complete in August 2009, shortly before we visited in October 2009. 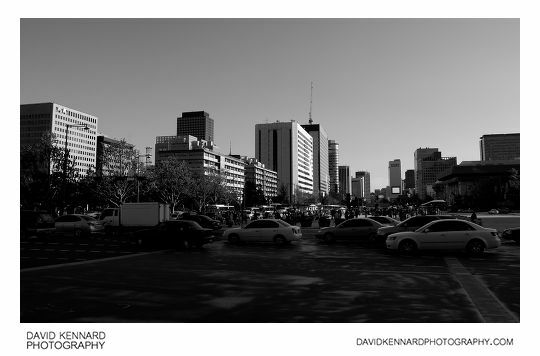 The construction of the plaza meant that Sejongno had to be reduced from 16 lanes to a piddling 10 lanes. Looking north, we can see Gwanghwamun gate, after which the intersection and plaza are named. Or rather, we would be able to see it if it wasn't under reconstruction. Gwanghwamun is the southern gate of Gyeongbokgung palace. Along Gwanghwamun plaza there are lots of various sculptures. 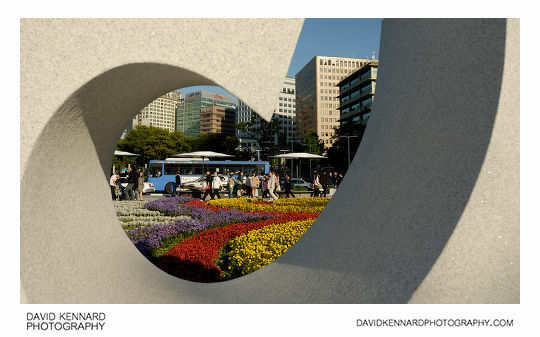 This photo is looking through one of the sculptures towards the flower carpet. 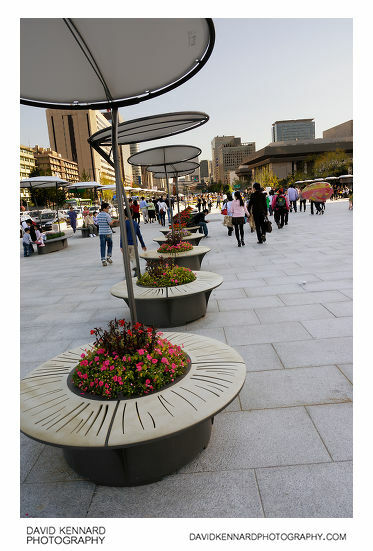 The flower carpet was planted with 224,537 flowers, one flower for each day from Oct 28th 1394, when Seoul was made the capital of the Joseon dynasty, until the plaza opened on Aug 1st 2009. 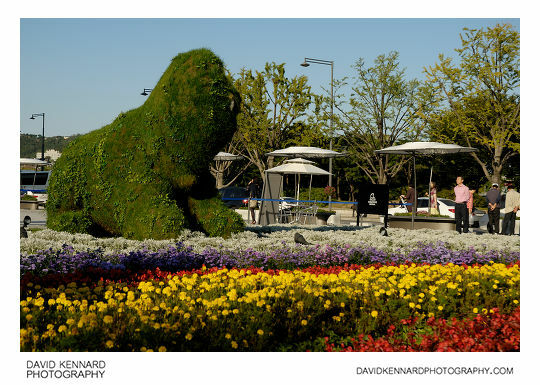 In this photo below you can see a bit more of the flower carpet and also a grass Haetae (해태) or Haechi (해치). I think that Haetae is the correct name, a fire eating dog that is the symbollic icon of Seoul, however the promotional boards etc. 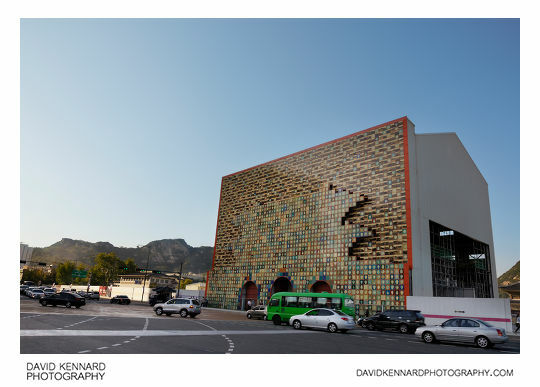 say 'Haechi Seoul'. The Waterways of History are 2cm deep, 1m wide, and 365 metres long. The one running down the western side of Gwanghwamun plaza (which is the side we were walking down) is paved with blank slabs, but the stream on the eastern side is paved with tiles that have been engraved with important events from the founding of the Joseon dynasty in 1392 until Gwanghwamun plaza was opened in August 2009. 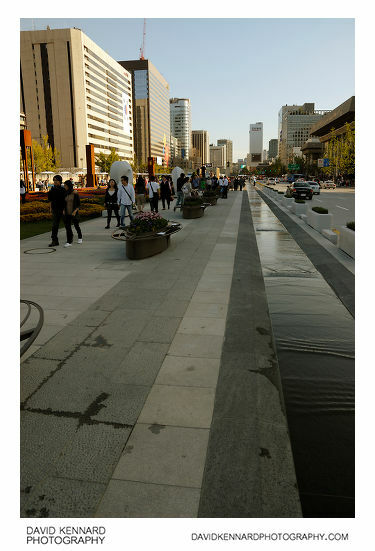 This shot below of the western waterway of history is looking north up Gwanghwamun plaza. You can see the reconstruction shell surrounding Gwanghwamun at the end of Sejongno, and Mount Bukhansan (북한산) in the distance.